Maybe your first experience of putting money in the bank wasn’t quite as heartwarming as this. But odds are, years later, you still refer to the balance showing on your bank account as being your money in the bank. But it isn’t. If we have a deposit box at the bank, the valuables we put in it are still ours. We’re just renting secure space to store them. In common usage, the word “deposit” means to set something down. But the use of the word deposit to refer to a bank account is misleading. A bank deposit is in reality… a loan. What the amount in our bank account really indicates is how much money the bank owes us. It is a record of the bank’s promise to pay us money, not the money we deposited itself. The difference is important. The truth is, when we hand the contents of our piggy bank to the bank teller, our money becomes the bank’s money to do with as it pleases. All of the money in the bank is the bank’s money. None of it is ours. That’s why the bank pays us interest. We have loaned the bank our money. This may seem to be a semantic distinction. We know we can go to the bank at any time and take our money out in cash if we want to. But the distinction is not semantic. Nor is it trivial. The distinction is crucial. What happens in banking affects everyone and yet few of us know anything at all about how banking really works. The entire world economy now runs on a system of credit provided by banks. And when that credit system breaks down, everyone suffers. To make things worse, the explanations for these breakdowns offered by the experts never look at the root cause… namely that, other than cash and coins, which make up just 1-5% of money in circulation, all the money in existence today was created as the principal of a bank loan, with the banks requiring principal plus interest as so-called “repayment”. Not only does this make the existence of money entirely dependent on the existence of bank credit, it makes the system as a whole bankrupt by design, as total debits, principal plus interest exceed total assets, from the moment the first loan document is signed. As the global banking system staggers towards worldwide collapse, more and more people are realizing they can no longer ignore the realities behind banking as it is practiced today. Many have lost their homes and jobs due entirely to the unsustainable practices of moneylenders. It is time people understood money and the pressing need to fundamentally change the way it works. Clarifying what the words used in banking really mean is the first step. Now that we know that a deposit is, in truth, a loan to a bank, the next question is … what is a loan that we take out from a bank? When we sign for a loan, we give the bank a pledge to pay the amount of the loan plus interest. In return, the bank credits our account in the same amount as this so-called loan. While we speak of the bank as having put the loan money into our account, in reality, the only thing the bank puts into our account is its promise to pay the money. What has actually happened is an exchange of promises. Neither party has delivered anything to the other, except matching pledges of debt. So, who is the borrower and who is the lender? The terms loan, lender and borrower are all misleading. The truth is that the two parties have traded promises to pay, and in the process created something called “bank credit” or “checkbook money” that can be legally spent as money. Bank credit can be spent because we, in our innocence, notice that, each time we deposit into our account, it increases our balance by the same amount. In fact, unless we put something in, our account will be empty. Thus it’s a natural assumption that money in an account is money someone put in. Uh-uh. The account is a promise to pay, not the money itself. In fact, a promise always indicates the absence of the item promised. Otherwise why does it need to be promised? Now, because all bank accounts are just promises to pay, the bank and the borrower can simply exchange promises and, in the flash of a few keystrokes, a positive balance appears in the borrower’s bank account without anyone putting existing money in. Now you know the real source of what we call a “bank loan”. How different would it be if two parties just got together in a basement with a printing press and created new money that way? We intuitively understand the act of fraud called counterfeiting. In printing fake $100 dollar bills, the counterfeiters also create new money out of thin air. Money gives us the ability to purchase the real goods & services of the world. It’s clear that the counterfeiters have created new ability to purchase real goods & services without giving anything in exchange… except a fancy piece of paper. Counterfeiters get something for nothing, directly at the expense of whoever gets caught with their counterfeit money. And if the counterfeit money is not discovered, it dilutes the money supply, stealing from everyone. Counterfeiting is a serious crime and it is easy to understand why. It’s cheating on a basic social agreement… Thou shalt not steal. But, taking a loan from a bank also creates new purchasing power. However, instead of being considered a form of theft, it is the very basis of our monetary system. How did one form of creating money out of thin air become a crime, and the other become standard business practice and the source of almost all our money? For this is what has happened. To understand how, we need to look at the history of the laws governing commerce, but before that, we need to understand the logic of the loan process itself. The borrower wants to purchase an item but doesn’t have the funds to do so at the present time. However the borrower does have confidence in having sufficient funds over time to pay both the original price of the item and the interest on a loan. So he goes to a bank to arrange a loan. The borrower is capable of making a credible promise of money in the future, but otherwise, at this moment, he comes with empty pockets. That’s why he needs the loan. We’re probably all familiar with what happens next. The bank gets the borrower to sign an agreement in which the borrower promising to pay the bank the amount of the loan plus interest or, in default, surrender to the bank the object that is to be purchased with the loan. This is done countless times every day all over the world, but there’s a problem. How can the borrower pledge as collateral something that the borrower does not yet own? If I wanted to borrow $10,000 from you to go on a luxury cruise to Europe, would you accept my neighbour’s car as collateral? Of course not, because you know very well that I have no legal right to give you my neighbour’s car no matter how much I owe you. But, if instead, I promise to buy my neighbour’s car with the $10,000 you lend me, the situation is different. You might agree to lend me the $10,000 believing I will buy the car and will pledge it as collateral for the loan once I obtain legal title to it. However, until the transaction is completed, your $10,000 loan cannot be secured by title to the car. This sequence of events problem could be very simply avoided. You could buy the car and then sell it to me. The bank could do it this way too. If the borrower commits to the bank to buy the item, why doesn’t the bank just buy it with its own money and then sell it to the borrower on time payments at interest? Well… the answer to that question is also very simple. It’s because the bank, like the borrower, has come to the transaction with empty pockets. The bank fulfills its part of the so-called loan transaction by creating an “account” for the borrower. The truth is… the so-called borrower has funded his own account by fraudulently pledging a car he does not yet own, as collateral. And the bank, the so-called lender, hasn’t put up any existing money at all…and, if all goes well, it never will. The borrower believes the new numbers in his account now represent his money in the bank. He, like the rest of us, doesn’t understand the difference between existing money and a promise of money. If you can spend it, what does it matter? So now the question is will the seller of the item accept the bank’s promise to pay? While some people may hold out for cash, most will say yes to a check or an electronic funds transfer from the buyer’s bank. Why? Because the seller knows from experience that she can “deposit” the check at her bank, and it will increase her account accordingly. So what happens next? Well, obviously the buyer’s bank now owes the seller’s bank the amount of the loan. So you might be thinking, isn’t this where the money comes out of deposits? The bank’s promise to pay the borrower has just been transformed by a transaction into a promise to pay the seller’s bank instead. So now the buyer’s bank has to transfer some of its existing money to the seller’s bank, correct? Yes, but probably only a small proportion. And, over the long term, as long as the bank gets its fair share of deposits, the net amount of existing money the bank needs to cover its loans can theoretically be zero. Well, imagine first that the seller has her account at the same bank as the buyer. She deposits the buyer’s check into her account. All the bank has to do to complete the transaction is reduce the buyer’s account by the same amount it increases the seller’s account. As both accounts are just promises, no existing money is involved in doing this. What is the end result? The bank has created bank credit for the borrower to the sum of $10,000. The borrower has bought the car that existed in the world of real things, and the seller now has that bank credit of $10,000. Thus a brand new claim upon $10,000 worth of real goods of value was accomplished with absolutely zero dollars of the bank’s or anybody else’s money! On top of that, the bank gets to have all this so-called money paid back by the borrower’s honest toil, PLUS interest, or the bank gets the car! Magic like this is usually seen on stage. So now let’s examine what happens if the seller deposits her check in a different bank. Won’t that require a transfer of existing bank funds from the buyer’s bank to the seller’s bank? Perhaps. But it will almost certainly never be anywhere near the whole amount because, in effect, the banking system functions as one bank. To illustrate, let’s add another transaction to this scenario. That same day, the seller’s bank made a similar loan to a little old lady who bought a mega home theatre system. The electronics store deposited her check at their bank. The electronics store’s bank made a similar loan that was deposited at the original borrower’s bank. And when all the various balances were settled, the banks didn’t owe each other anything, and even if there were differences, they would have been just a small portion of the total credit created. So, at this point, we can say that, although banks don’t actually lend out their depositors’ money, as most of us imagine, they still need deposits to make loans. This is because banks need incoming credit from other banks to offset their own credit being deposited at those banks. As long as banks keep their outgoing credit balanced with incoming credit, they are free to make new loans and thereby keep creating brand new credit money. None of it will ever have to come out of the bank’s pockets. The bank is free to invest its own funds in corporate and government bonds, and whatever other instruments their charter allows. If one draws a diagram of it all, it looks like this. The interest governments and corporations pay the banks on their bonds, is paid by us. We pay it as a portion of our taxes. And we pay it in the price of all the goods and services that we buy. And there‘s another thing passed onto us as well. And that’s the risk that the bank will go broke and NOT be able to honor its promises to pay. Now, you may wonder ‘how can a bank go broke if it doesn’t put up any money up in the first place’? What have they got to lose? The answer to that question is that banks differ from counterfeiters in that the banks are legally allowed to create new money, but only by certain rules of accounting. Banks can only create money by entering a borrower’s payments and collateral as an asset on the positive side of the ledger, balanced on the negative side by the loan, or what the banks call, the “deposit liability” created by the bank. When the borrower defaults on the payments, the asset pledged as collateral is seized by the bank and sold. In a declining market, when repossession is most common, the new lower value of the asset doesn’t cover the bank’s liabilities, which were based on the previous higher value. This shows up as a loss on the bank’s books. When foreclosures are rampant as in a collapsing real estate market, much of the value of the bank’s collateral simply evaporates as home prices drop, exposing the bank to huge losses. In truth, it’s all just numbers, created out of thin air. But banks must adhere to the dictates of these numbers, and the consequences of bank arithmetic gone wrong can include economic standstill, social disintegration, total financial chaos, lawlessness, starvation and war. However, for the purposes of understanding the anatomy of a loan, we shall assume that the system is still functional and all three of the loans we were looking at will get paid. The end result is that not one dollar of existing money has changed hands, but $30,000 of new bank credit has been created and spent into the money supply…and each of the three banks gets to collect interest on $10,000 of it. Is creation of this brand new $30,000 really an act of fraud, like counterfeiting? The obvious difference is that the banking system is legal, regulated by government and disciplined by the courts to follow the rules of accounting. Another difference is that there is no obvious victim, like the person getting caught with a counterfeit bill. Banks argue that the buyer and seller both got what they wanted and agreed to, so where is the fraud? And if there was a fraud, who lost out? Well, to determine that, let us list who got what out of the deal. The borrower did get the item he desired on terms he willingly agreed to. He may curse his decision later as he struggles to make the interest payments, or… he may live happily ever after, thankful he got the loan. the seller got an increase in bank credit, which she’s been conditioned since childhood to think of as her “money in the bank”. She is confident that she‘ll be able to spend it in turn, and she will… so as far as the seller is concerned, she has been paid in full. She’s happy. So who, if anyone, suffered as a result of the deal? Is there another party to this transaction we’ve overlooked? Well, there’s also the bank that gets to collect interest on a promise to pay money. That’s the business they are in and usually do very well by. And anyone else? Well, where did the car come from? It came from the world of real things. Natural resources, energy and labour were expended to produce it. What if we consider the hidden party to be Society at large, and the natural world from which all things ultimately come? Because the brand new bank credit money didn’t just sit there. It got spent into the general circulation in the real world. It’s the real world that ultimately gets the new money in exchange for its car. This new money might stimulate new production, temporarily enlarging the economy, making lots of people happy. In fact it often does, as most bank credit comes into being as a home mortgage, stimulus for the residential construction industry, a big provider of good-paying jobs. However, after its initial productive use, this newly created money will basically just dilute the money supply reducing money’s purchasing power by a very small amount. So, in contrast to counterfeiting where the loss occurs to a specific victim, here the loss is borne by us all, because the real substance of the loan, the car, was extracted from the economy at large by a slight loss in the value of everyone’s money. To continue our comparison of bank credit with counterfeiting, counterfeit cash eventually gets detected and removed from circulation, causing a direct loss to whoever accepted it. There is, of course, no guarantee of how much will be detected nor any prescribed schedule for its removal. Bank credit is also removed from circulation over time because, as bank credit is paid back, the principal part of every payment is extinguished. Now, remember that almost all the money in existence today is bank credit. Therefore, almost every dollar that passes through our bank accounts has a scheduled appointment to one day be paid as a principal payment on a bank loan and cease to exist. On top of the Principal are the interest payments, which will become bank income, much of which will be recycled into the economy as interest to depositors and other bank expenses. So it’s not immediately apparent that there’s a loss to someone as a result of bank credit being withdrawn from circulation, the way there is with counterfeit cash. But if we look closer we find an interesting situation. We don’t need anything more than fundamental arithmetic to understand the power that lies in controlling the money supply and why, as currently designed, total debt must constantly expand or the system collapses. Whenever the rate of debt money creation falls behind the rate of debt money destruction, the total amount of money in use will shrink. This is called deflation because the money supply is shrinking like a deflating balloon. The result is less money relative to the goods and services available. With less money around to pay for them, the price of goods and services go down. At first this sounds like a good thing and it could be… if money were NOT created as debt at interest. For anyone not in debt, deflation would be like a general dividend on money – paid in goods & services of our choice. It would be as if money were the people’s stock in their own prosperous company, their nation. People wouldn’t have to demand a pay raise. If a nation were more productive as a whole, thus deserving of a raise, everyone would benefit automatically by having their money buy more. However, this is definitely not the effect deflation has in a system where money comes in the form of interest-bearing debt. More than 95% of all money currently in existence is in the form of debt to banks, promises to pay with interest added. As we have seen, the Principal is created, but not the Interest. Due to the time delay between money’s creation and its repayment, and the recycling of interest earnings as bank operating expenses, most of us can keep up our payments while the money supply is increasing. However, if the money supply or total debt is decreasing, money becomes harder to earn due to its scarcity, and fixed payments become harder to meet. 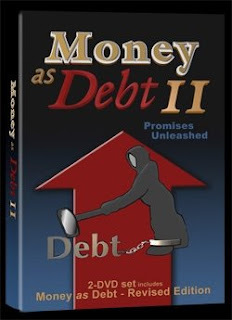 For those heavily in debt, the money shortage can become catastrophic. Unfortunately, the psychological effects of falling wages and prices rapidly accelerate the process, as borrowers, including large businesses, lose confidence in being able to repay loans. So they don’t sign up for any and, without new loans to replace old loans, the money shortage rapidly gets worse, resulting in a decrease in jobs and purchasing power, even in the midst of abundant resources and productive capacity. This dismal spiraling math makes mass foreclosure inevitable. Prices plummet as no one wants to spend their money. Shrinking values destroy the value of loan collateral, causing banks to write off huge losses. Some even close their doors. Consumer and business confidence is lost. Rampant economic and social dysfunction follows. This disastrous spiral cannot be turned around unless someone, usually government, either creates new money itself or goes deeply in debt to private banks in order to create enough new money to re-organize and rejuvenate the economy. The most familiar example of this is the stock market crash of 1929. The psychological fallout of the stock market collapse resulted in less borrowing and thus less new money. The Federal Reserve did nothing to correct the resultant deflation, and by 1932 the money supply had been reduced by a third. Countless people were evicted from their homes because the money to make their mortgage payments simply ceased to exist. Then, in 1932 Franklin Roosevelt became the US President. Roosevelt’s New Deal set out to restore the economy by restoring the money supply. To counter the money shortage, Roosevelt borrowed from the private banking system. Factories started hiring again. But only when the war arrived, was there suddenly no shortage of jobs or funds available to do what was necessary for the war effort. It was the money expanded on World War 2 that ended the Great Depression. The War also resulted in 50 million deaths worldwide and led to a new hostile international balance of power, with its attendant arms races, mounting debts and sweeping social and technological transformations. The cycle of economic boom and bust is commonly called the business cycle, as if it were a natural occurrence like the hydrological or carbon cycle. These natural cycles are ultimately driven by the Sun. But what is it that drives the business cycle? One answer is the supply of money. And, as we have seen, the supply of money is dependent on loans. So let’s look at what happens during the lifetime of an individual loan. We’ve seen how bank credit is nothing more than the bank’s promise to pay which the bank has created on its books to balance the borrower’s promise to pay that it has received. The bank’s promise to pay is usually spent on some real good or service and allowed to circulate making the efficient exchange of goods and services easier to accomplish. As a medium of exchange, today’s promise-to-pay money is unsurpassed in its usefulness and flexibility. However, because no money is created to pay the Interest, a seemingly impossible situation is created. On the face of it, if borrowers had to pay the interest they owe all at once, they would have to fight it out for a limited sum of existing money that was very much less than the total owed. The percentage that would be unable to pay off their loans would be simple to calculate. However, interest is usually paid over time, not all at once. If this interest income is recycled into the general economy as spending, it can be available to be earned repeatedly. Once we understand this, the question of whether interest is actually unpayable becomes more perplexing. Is there such a thing as a sustainable system of lending that does not produce mathematically inevitable defaults? In the Middle Ages, USURY, meaning charging interest or any form of making gains solely from having money was condemned as a sin. While the justification was moral, the reason was practical. In a fixed money supply like gold, anyone systematically rolling over all of their loan money at interest will soon end up with all the money. This problem was a big factor in the ruin of Rome. Private accumulations of gold forced the government to make coins made of base metals instead of the real thing. Debased currency led to failing confidence and ultimate decline. The lesson was well learned. For the next thousand years, the Roman Catholic Church declared collecting interest on a loan to be a sin punishable by excommunication. In some countries, the penalty for practicing usury was death. Is charging interest really a sin? While today it seems very reasonable to charge for the use of money, there’s a simple and unavoidable problem with doing so. Unless moneylenders spend every penny of interest they receive in such a way that the borrowers can earn it again, the borrowers are going to come up short, regardless of their hard work and personal virtues. Someone will default, simply as a result of the arithmetic. This is easy to picture where there’s a fixed money supply like gold coin. As long as all of the coins taken in as interest are spent so that the borrowers can earn them, the same coins can be used to pay the interest over and over. The lender can profit by buying real things with this coin, but the coin itself must be spent not lent nor removed from circulation. Leaving aside any moral considerations, this arrangement would be sustainable. However, if the interest coins are re-lent at interest, or removed from circulation by hoarding, there will be an inherent shortage of coins with which to pay off the aggregate debt. The situation is essentially no different in our current debt-based system. As we have seen, nowadays virtually every dollar comes into existence as debt, with a scheduled appointment to be extinguished as a Principal payment on the loan that created it. Thus, for all borrowers to be able to make their payments of principal plus interest, two things must be true. The dollar created as the principal of the loan must be available to be earned by the borrower in order to make the principal payment that extinguishes that dollar. And… every dollar the borrower pays to the bank as interest must also be available to be repeatedly earned by the borrower so that it can be paid as interest again and again. There is a common theory undoubtedly popular with lenders, that because the banks spend their interest earnings as operating expenses, interest to depositors and shareholder’s dividends, there is, in fact, enough money released back into the community to make all payments. However, like the idea of absolute shortage, this is an oversimplification. Picture what happens if someone else, such as you or I or an institutional non-bank lender obtains this dollar and then lends it out at interest? Well… now that same dollar is simultaneously owed to two lenders and has two simultaneous interest charges attached to it. In addition, if this dollar is loaned, repaid and re-loaned by the secondary lender, it is not available to pay off the principal of the loan that created it, except as another loan. So… can we borrow from Peter to pay Paul and borrow from Paul to pay Peter? This gets inter1sting. We can… however, each time money is borrowed there’s an interest charge added that also must be paid. If all added interest charges can be earned, all payments can be made. On this basis, many economists and defenders of the current system claim there can never be a shortage of money and all payments can be made. But this seems to be a false assurance. For instance, if secondary lenders capture some of the money needed to retire the loan that created that money, the original loan can never be retired. The deficiency will have to be borrowed over and over forever, each time at interest. Each deficiency will be cumulative, adding to an ever-building total of debt that can never be paid off. And, it stands to reason that for each added interest charge in the system as a whole, something extra is demanded of the system as a whole to pay for it. This affects everyone, producers, governments and consumers. For producers that something extra must be raised through higher prices or more sales. However, competition for more sales usually requires lowering prices, necessitating even more sales and leads to overproduction and saturation of the market. The end result can mean job losses, plant closures and bankruptcies. For governments, that something extra is raised by increasing taxes. But increasing taxes drains money from the productive economy, resulting in a reduction in the collective ability to pay taxes, which then necessitates increased government borrowing and additional interest charges. For consumers, something extra can mean getting an additional job, or borrowing to pay past debts, or paying off debt over longer periods of time. However, competition for jobs tends to lower wages and paying over longer periods of time adds enormously to the amount of interest owed. And, of course, borrowing to pay off past debts is like trying to fill a hole with more hole. And that is the situation we find ourselves in today. Producers can’t sell more because consumers can’t afford to buy. Governments are cutting taxes not raising them hoping to stimulate consumer demand. And consumers’ real incomes are limited or even falling due to competition for a limited number of jobs. Therefore, any increase in the total amount of interest charges within the monetary system as a whole, will result in a genuine shortage of money. This is because the real productive economy is limited by the availability of nature’s resources.The productive economy exists to serve actual needs. It simply cannot keep pace with the demands of the artificial financial economy which has an unlimited appetite for profit and which operates with no regard for the natural limitations of the real world. The theory that there’s always enough money to pay the interest has a certain elegant simplicity. However, by the very nature of the assertion, to be true, it has to be 100% true. This is impossible. For one thing, secondary lenders, who are not banks do comprise a significant proportion of lenders. And they add their interest charges to money that already bears an interest burden. Beyond that, we have a cultural expectation. Everyone who has money expects it to generate more. Money that needs to be spent and made available to be earned by its original borrower is, instead, lent at interest or invested for gain. Therefore, we can conclude that the two conditions that must be true for all borrowers to be able to make their payments of principal plus interest, and thus permanently discharge their debt, those conditions are not met by the current system. Nowhere in the current system is there any restriction on re-lending money that was created as a loan. Nor, is there any obligation upon banks to make their profits from interest available to be earned by borrowers, enabling them to extinguish their debts. Quite the opposite, banks invest these profits to make further profits. And it’s not just the banks that cause the problem, anyone who takes their ball of money and starts rolling it like a snowball to make it bigger, does so at the expense of borrowers who will not find that money available to pay their debts, except as more debt. And of course, those rolling the biggest snowballs pick up the most snow. As the saying goes the rich get richer and the poor get poorer. Money needed by borrowers in the lower realms of workaday productive economics moves upstairs to play in the casino world of abstract financial profit. And that’s a world where transactions are little more than gambling on numbers in an effort to achieve higher numbers. They have little or nothing to do with providing the necessities of life. Today the largest volume of money by far is changing hands in what is best described as the gambling economy, the foreign exchange market, the derivatives market and the rest of the financial instruments being played by banks and investment funds for as much profit as possible. For example, the volume of trade on the world’s foreign exchange markets, in just one week, exceeds the total volume of world trade in real goods and services during an entire year. This money is in continuous play by speculators looking to make windfall profits on currency fluctuations. It exists, but only in the gambling economy. So how “unpayable” is the ubiquitous interest burden in actual fact? That could only be determined with certainty, by tracking all the money in the world. With over 6 billion people earning, spending, borrowing and lending, the worldʼs money flows are at least as complex as the flows of the ocean, they are impossible to know. But the direction is pretty clear and simple… and itʼs the “same old story”. The rich are taking increasingly more money into the gambling economy, where ordinary borrowers have almost no chance to obtain it. And, the only way the system can stay solvent is to create more money. And as money is created as debt, the only way to create more money is to create more debt in every way possible, including ridiculously easy credit for unqualified borrowers, massive government expenditures on security and war and bailouts of insolvent banks. How does the individual loan cycle relate to the boom and bust phenomenon known as the business cycle? The individual loan cycle can be described like this: first, there is economic Stimulation because of its initial spending. This is followed by inflation because new money basically just dilutes the money supply. And eventually, inflation is followed by deflation as loan repayments gradually extinguish the Principal, removing that money from circulation. As long as the individual loan cycles don’t match up, these cycles can smooth each other out. This creates a fairly stable money supply that leads to fairly stable prices, although continuous growth of the money supply is required, at least in part, because as you will recall, the money to cover the interest was never created. This is the model on which our economy is currently based. Avoiding deflationary spirals and keeping inflation at a level that doesn’t upset people’s apple carts, constitutes the art of managing the economy, which is rather narrowly defined as achieving so called “price stability”. However a look at the purchasing power of the US dollar in real goods over the last century instantly reveals what this so-called “price stability” has really meant. The dollar has clearly lost almost ALL of its value, 96%, and is continuing to do so at a rapid pace. So price stability is NOT being achieved. And, one hardly needs a degree in psychology to understand how human nature itself would turn the individual loan cycle into the collective phenomenon of the business cycle. The simple reason being, that if one person sees great prospects and is doing well borrowing and expanding, others would have the confidence to do the same. Beyond the merely psychological effects, if one business is expanding on the basis of credit, its suppliers and distributors will find it necessary to do so as well, or lose that business to someone who will. The same herd effect would occur for a gloomy outlook and accompanying credit contraction. Thus, it is entirely predictable that individual loan cycles would have a built-in propensity to line themselves up rather than be randomly distributed. And when they do, we see the larger scale called the business cycle emerging directly from the cumulative effects of individual loan cycles. So, to sum up, one could say that, out of the exchange of promises made by the bank and the borrower, society gets chronic inflation and a dependency on banks for increasing infusions of money to pay ultimately impossible interest payments. This results in an inescapable treadmill of accelerating debt and depreciating money. The only alternative being a deflationary collapse of the economy, followed by social chaos or war. This eminently unhealthy situation filters down through society, wreaking harm on every level. We are like addicts, but the fix is not more and more heroin, it’s more and more credit money, and, eventually our collective ability to borrow and repay so much credit becomes exhausted. This then creates the need for constant expansion of credit into new markets, in essence creating a fiscal imperative to drive everyone in the world further and further into debt forever. In the United States, this constant debt expansion has led to a Total Credit Market Debt in 2008 of more than $53 trillion dollars, which is about five times the total annual income of the entire country. So is the world at large happy about its end of the loan transaction? Probably not. But the world at large has very little awareness of where these problems originate. The elusive system of counterfeiting and hidden control that is modern banking. And how about the banks? How have the banks fared as a result of this system? Well first, by putting up only a small fraction of the money they ostensibly lend, the banks have obtained a river of income from interest payments on consumer loans and mortgages. Second, by using their credit powers to acquire large portfolios of corporate and government bonds, banks collectively appropriate control over government and industry. And, thirdly due to the inevitable defaults and foreclosures, the banks gain legal title to a lot of real property the world over. And finally, if the worst happens, if borrowers default en masse causing the banks large losses, the government is forced to rescue the banks with multi billion dollar bailouts to save the financial system. And what are these bailouts financed with? You guessed it. More taxpayer debt. It is really quite an achievement to pull this off, and without most of the victims even being aware of it. If you’re now thinking “there ought to be a law”, well, there is. There’s a whole body of law that makes all of this legal. So how did a system like this ever become the law? To answer that, we go back to England in the mid-17th century. With the development of better ships, and the new explorations they allowed, trade was expanding rapidly. In order to carry out commerce, especially over great distances and lengths of time, written contracts were becoming more and more important, and more sophisticated. Under English Common Law it had long been established that a contract could only be enforced if something of real substance had changed hands. A transfer of goods or rights in property was the real stuff of the exchange and that was what the court would evaluate for fairness, not just the words on the document. A contract under which there had been no exchange of consideration, meaning real goods or rights in property was deemed to be empty and was therefore not enforceable by the court. So a contract in which a borrower say… pledged a car he does not own in exchange for a bank’s promise of payment would not even qualify as a contract. No Common Law court would enforce it. As well, in the event of a dispute over a contract, under Common Law, only someone who had actually provided consideration to the transaction, in other words, only someone who “delivered the goods”, had the right to sue in court for fulfillment of the contract by the other party. This right was not transferable to a third party. When early traders went off personally on expeditions with trade goods, they bought those goods at home with their local currency and would sell them for foreign currency in the distant destination. They would then buy foreign goods with the foreign money, bring those goods home and sell them for their local currency. Pretty simple. But, as trade became more sophisticated, traders became more inclined to stay home and just hire ships to carry out deliveries. This gave traders the freedom to import cargoes of foreign goods from different sources than the destination to which their home goods had been exported. Thus a problem was created. The exported goods had been paid for with foreign coin, the value of which needed to be spent somewhere else. Moving money as coins entailed a high risk of theft, as well as the near certainty of partial loss by currency conversion in a different land. This problem of payments from a distance was overcome by the use of Bills of Exchange. A Bill of Exchange was a signed order from the payer to an addressee demanding that the addressee pay a certain specified sum of money to the person identified as the payee. These were secured by signature, and they could not be acted upon in court by anyone other than the original parties. Thus, they were of no use to a thief or any other third party. You probably recognize that these were the precursors of cheques. I the payer, instruct the bank, the addressee, to pay the payee, a person named on the cheque, a certain sum of money. This was all well and good for transactions among parties who were known to each other. The bill of exchange was used merely as a way to order payment in coin at a distant location. But merchants soon wanted more flexibility. They wanted to be able to use Bills of Exchange to reconcile payments amongst many merchants in many locations, using Bills of Exchange like money itself. For this to work, bills of exchange had to be assignable to, and enforceable by, third parties. As we shall see, this was the moment in legal history that gave sanction to the banking system we have today. A third party who might have honestly purchased a bill of exchange several steps removed from the original exchange, could not be expected, nor would he have the right, to show up in a Common Law court and defend the validity of the contract and collect on it. This made third party Bills of Exchange an unacceptable risk. So, in order to be able to use bills of exchange as a convenient and guaranteed third party payment system, essentially equivalent to money, the Common Law practice had to be set aside regarding bills of exchange. In England, by a series of legal decisions from 1664 to 1699, this problem for commerce was remedied by making bills of exchange enforceable by third parties. If a third party had purchased a bill for valuable consideration and in good faith, having no apparent reason to suspect fraud or some deficiency in the right of the seller to sell it, then the bill automatically became good and enforceable by the court against the signer. What did this change mean? It meant, essentially, that any Bill of Exchange would be considered legitimate once it was sold. Bills of Exchange and all other subsequent types of signed promises to pay, with the notable exception of cheques, became transferable and enforceable in court, just what the merchants wanted. Now debts contracts could be sold like things and transacting business would be a whole lot easier. Not only that, it opened up a whole new market for profit-seekers, trading in bills of exchange themselves. The marketing of debt was born. The change in the law had another effect as well. It made it possible to trick or even force a person into signing a legally binding promise to pay, and then, if that promise were purchased by a third party for real consideration and in good faith, it would be enforceable against the signer in court. Ultimately, this became one of the foundational principles of the Uniform Commercial Code, which governs the conduct of business in the United States, and by extension, in most of the world. Think about it. If we buy a stolen laptop from a guy on the street, we’re guilty of receiving stolen goods, a criminal offense. It doesn’t matter if we paid honest money and were unaware the goods were stolen. The court will restore the goods to the rightful owner. We as purchasers, innocent or not, lose our money and may even be charged with a crime. But if we buy a loan contract from a banker and give him real value for it “in good faith”, it doesn’t matter that the loan contract may have come into existence under false pretenses. Whoever signed it is required by commercial contract law to pay up, and the courts will enforce the obligation. Today debt contracts come in a myriad of forms, including and especially loans and mortgages. It’s significant to note that, just as these Common Law restrictions were being removed, the brand new Bank of England was being established, the first bank state-authorized to create money out of thin air. The new laws fit in perfectly, making the new bank’s “empty” contracts enforceable against the so-called “borrower”. “The bank hath benefit of interest on all moneys which it creates out of nothing.” – William Paterson, founder of the Bank of England, c1694. Those who have discovered the true nature of their own bank loans and have attempted to challenge the validity of their debt contracts in modern courts have discovered to their dismay that this commercial contract law is still the bedrock defense of money as debt. The bank will have sold the original loan agreement to a third party for value, and even though that third party is often just a sister company of the bank, all that matters to the judge is who possesses the document, what it says, and whose signature is on it. The bank’s failure to inform the borrower about the true nature of the loan contract, and the absence of any actual money loaned on the bank’s part, is not relevant. So, to conclude our investigation, it appears that modern banking practice rests on several distinct violations of Common Law, common sense, and natural justice. The first violation is the fraud the borrower commits by pledging as collateral, property the borrower does not yet own. And the bank is complicit, as it knowingly accepts the fraudulent pledge as backing for the credit it creates. The second violation is the failure of the bank to disclose the true nature of the contract. The bank calls it a loan, leading the borrower to believe that he or she is receiving a loan of existing money. But the bank knows full well it has provided only a brand new promise to pay simply typed in on a computer screen. A promise that the bank knows it will probably never have to fulfill. Thirdly, the loan agreement should be invalid. Because impossible contracts are legally invalid.The bank is creating an impossible contract because the conditions required to guarantee that the borrowers have the opportunity to pay off the Principal plus Interest are not met. Unless the system enforces 100% recycling of both Principal and Interest, which it emphatically does not, some borrowers are going to default and lose their collateral, simply due to the systemic shortage of money. The fourth violation is the violation of natural law by the law of contracts, which confers automatic legitimacy of title on any contract if the contract is sold to a third party for valuable consideration. This violates the principle that one cannot give better title to something than one has. But perhaps the biggest fraud of all is that most of the people who produce the real wealth of the world are in debt, and at risk of losing everything they have worked for, to bankers who fabricate money out of mere promises to pay. And where does this leave us? We are hostages in an economy that must grow faster and faster to keep up with an ever-growing money supply or the entire system collapses in ruin. The money system as currently structured, refuses to recognize that the real economy is limited by the capacity of the planet to provide the raw materials and waste disposal services the economy needs. The planet is finite. And therefore, it should be obvious that the economy cannot grow at an accelerating pace forever. Our current money system runs like the bus in the movie Speed. It could not slow down or the bomb planted on the bus would go off. And, our situation is even worse because the rate of debt creation must forever accelerate or the entire economy crashes. The notion that infinite perpetually accelerating growth is possible is the great fallacy of modern economics. It is a fatal delusion born of greed. An economic, social and environmental crash of unprecedented proportion is surely inevitable, and this monetary system is utterly and hopelessly incapable of adapting to it. No wonder monetary reformers around the world insist that the entire monetary system needs to be rebuilt, from the ground up. So… what is the solution? One idea many people suggest is to return to the days when money was backed by gold. Gold, they argue, is the true money because it’s inherently valuable. The underlying principle here, is that money should be a commodity that is valuable due to its scarcity – as gold is scarce. As a general rule, those who hold this view of money also believe that money should exist independent of government. Another school of thought, diametrically opposite, is that the creation of money should be the exclusive prerogative of Government, which represents all the people, should spend money into existence in the public interest, thus backing the currency with what it was spent on. Having taken back the power to simply spend money into existence, government would never need to go into debt or pay interest. Of course, government spending without limit would result in a worthless currency. To prevent inflation, money would also have to be extinguished. This could be accomplished using a wide variety of taxes, resource royalties and user fees. Government spending and government taxes would, therefore, be interdependent and would equal each other in a perfect equilibrium. However, the goal of taxation would be to achieve price stability, as the government would have no need of tax revenues in order to operate. Over the centuries, both the gold-based system and various government credit money systems have been used, with the gold-based system prevailing well into the 20th century. This wasn’t because government credit money didn’t work. It did, within the country itself, where it was accepted in payment of taxes. But until the invention of modern currency exchanges, international trade had to be carried out in gold. In addition, gold has had an almost supernatural fascination for humans for a very long time. We’ve been conditioned for millennia to think of money in terms of portable inherent wealth, as in gold coins. However, this is not the only way to think of money. Nor, in the era of runaway debt-money, is it any longer accurate. Money is, at its root, an idea… an idea that humans invented in order to turn simple subsistence into complex civilization. It’s the development of money that made possible specialization of labor, and the indirect exchange of goods and services. Throughout money’s evolution, from direct barter to standard trade goods, and on to standard coins, to paper promises of precious metal, to digital promises of paper cash, and now to digital promises to pay digital promises – throughout this long evolution, the prevailing idea has always been to achieve greater flexibility by using convenient and secure promises to pay instead of money itself. The problem with promise-to-pay money has always been that it provides a golden opportunity to cheat, to create more promises than there is real stuff to back those promises up. But is there a way to make the exchange of actual money just as convenient and secure as the promise-to-pay system? Now there is. Digital money convenient and secure, is now a possibility because of new encryption technologies. It works like this. Imagine taking the serial number off a dollar bill and dispensing with the paper. What do you have? a digital dollar, a digital dollar that can now be electronically transferred around the world just as easily and securely as a promise-to-pay dollar. However, and this is the big however, the digital money while being entirely electronic, is also like a metal coin: It can never be in two places at once. Thus, the multiplication of promises can be prevented by insisting on actual payment in cash, paper or digital. We don’t even need to keep this digital cash in a bank as it provides its own safekeeping and can be transferred by Internet. And instantly transferable digital money could perform intelligent functions far beyond anything money has been capable of before. For instance, with simple math programmed in, money could be made to calculate its own value, eliminating human speculation, manipulation and error. Wouldn’t that be something? In the meantime, efforts are already underway to reform the monetary system through legislation. Initiatives like the Monetary Reform Act and the American Monetary Institute’s Monetary Act have already been written, prescribing in detail how to return the power to create money exclusively to government, and thus limit banks to lending existing money, just the way most people imagine it works now. While differing in detail, all such reform proposals, in whatever country they originate, always advance the same simple idea. The benefits of money creation belong to the public. At present, money is created not for the benefit of society, but for the profit of private banks. Banks like to create enormous amounts of money from our debt, because the more we borrow into existence, the more interest the bank gets to collect, and the richer the bank becomes. In the process, the banks gain more control over everyone, individuals, industry and government alike. Abundant money too often leads to speculative asset bubbles that make insiders rich. But, as we have witnessed, these bubbles inevitably burst, under the unbearable weight of ever-increasing interest demands. The losers are many, including governments. Already burdened with huge debt and shrinking revenues, governments are forced to add trillions to that debt in order to rescue the banks that are the cause of the problem… Otherwise we would have no money system! It’s an absurd situation, and a tragic one, considering that government could instead, create the money itself, and spend it interest-free on infrastructure, education, or universal health care. And most of that debt-free money would enter the economy as wages, circulating through all levels of society for everyone’s benefit. This kind of abundant money would fund a re-invigorated productive economy, in which the savings of the people could fund honest loans of real, existing money. At its root, money is a means by which we exchange real value. Without real value in the world, money is nothing. As we have seen, it’s the real world that makes the loan, not the bank. We the people, in conjunction with the material blessings of the natural world are the source of all real wealth. Therefore money creation and its benefits belong to the public, not to private bankers. And what about interest? As we have seen, interest poses an arithmetic problem and it’s a problem that can only be solved in three ways. One, defaults and foreclosures, two perpetual growth of the money supply, or the preferable, and only other solution, 100% recycling of interest as spending. But such full recycling could only be accomplished by nationalizing the banking industry in the public interest. For example, interest earnings from public service banking could be paid to all as a citizen’s dividend, or it could be used to fund government in place of taxes, as was done successfully in colonial Pennsylvania. And that’s just one instance of a society that organized its monetary system differently. There have always been alternatives. And there are alternatives now. What the evolution of money really teaches us, is that the real measure of money’s value is, very simple, its usefulness as money. And there are several different ways to create useful money. For instance, money can simply be an individual’s private promise to pay. A pledge of one’s own product or service as in such community currencies as the LETS systems or Time Dollars. Thousands of these community currencies already exist in circles of trust where members can be counted on to honor the credit they issue for themselves. And such community currencies can be a lifesaver in the event of a catastrophic collapse of the conventional banking system. When money shortages or hyperinflation disrupt trade and bring economic standstill, a working community currency can sustain a local economy. Are such proposals radical? You bet. But there are unprecedented challenges before us. No longer can exponential growth allow us to sustain a monumental debt that must ever increase to prevent the house-of-cards collapse of the whole system. Increasing wealth disparity, crushing debt, failing banks and social and environmental catastrophes are what we face unless we radically change course. We must transform our monetary system to one that can adapt to a future we can now clearly foresee. To begin, we must examine monetary system designs that can deal with widespread economic shrinkage, without inducing mass foreclosures and bankruptcies. But, what can you do right now? Well right now, there are people and organizations around the world that understand the problems and the injustice of today’s monetary system and you can join them in their effort to bring about the fundamental changes we need. It’s time to talk to our friends. A financial crisis is the ultimate teachable moment. When bankrupt banks have to be bailed out by the governments the banks were formerly lending to, the contradictions, the fraud, and the fatal flaws of the current system are laid bare for all to see. But the solutions are there to see too, if we look. We cannot afford business as usual. Making adjustments to the current system will not save us. The changes we need to make are radical and dedicated to the good of all, not the profit and control of a few. To make these changes, we must leave behind our outmoded assumptions and misplaced faith. We must face the challenge of a complete transformation. Reality calls.